Loves his kids, loves his work!! 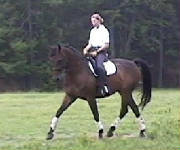 Nicholas was a very modern style warmblood with elegant movement, tremendous athletic ability, and a fantastic disposition. 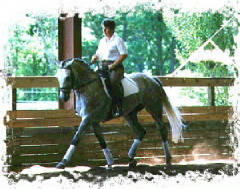 He competed successfully in Dressage through second level, and went on from there to pursue a very successful jumping career. He has won many Championships and year end awards. 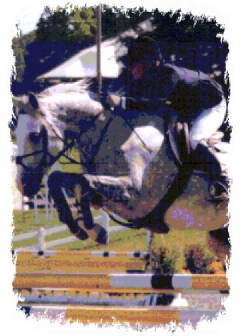 PHR Junior Jumper year End Award in South Carolina in both 1998 and 1999. 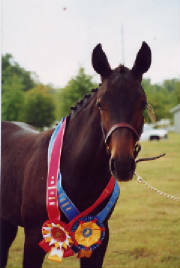 Soubrette, 2000 5 Year Old Young Jumper Champion for the Entire Eastern U.S.
Nicholas has won Get of Sire Against well known stallions West Coast, Pikor, Wummerstern, Tantris, Dynamic, Bruderherst, and many more prominant warmblood breeding stallions at several shows throughout the U.S.
His offspring have won the Belgian Warmblood Yearling or Two year Old Futurities in 1996, 1997, 1999, 2000, and 2003, and his foals have been consitantly in the top ten every year. 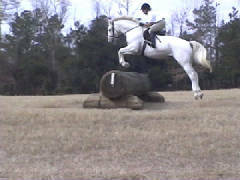 His daughters are always in the top five mares in the U.S.
Nicholas Produces Wonderful Athletes with Great Attitudes!! 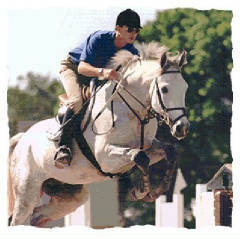 Emerald Spring...Breeding, Training, Sales, Lessons. 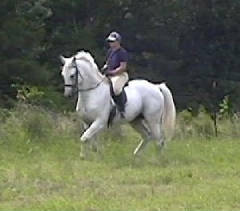 Dedicated to the health and well being of both horse and rider!